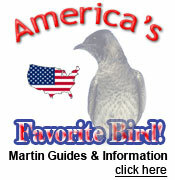 Purple-Martins.com is a website of Shop Carolina, Inc.
Do you have questions about an item or need help placing an order? We offer our expert personal service Monday through Friday from 9:00 AM to 5:00 PM Eastern time, we never use third-party call centers to handle your questions and concerns. You can send an email to Service@Shop-Carolina.com or phone us toll free at 877-874-3726. After hours, our telephone system records messages. Sometimes call volume during the day exceeds capacity and you might be prompted to leave a message then as well. We always return calls and respond to emails. Do you have questions about your existing order? Using the Reply function in your email program, ask your question by replying to the order confirmation email you received from Service@Shop-Carolina.com. This order confirmation email contains the information we need to research and respond to your question. Our concern for satisfaction extends 24/7 - so send us an email at any time. We will always reply, often right away! You can also phone us at 877-874-3726. We offer a no hassle Money Back Guarantee and are here to help.